The phrase Shape of Combat is used to describe the nature of a fight. As was written in earlier articles in this series, no one knows what the shape of Viking combat was like, so we are forced to use many sources to create a speculative reconstruction. Many people think Viking combat took the form of two big, hairy men, taking turns delivering massive blows to one another's shields, attempting to force their way through their opponents' defense as if they were chopping down a tree. Some people think Viking combat took the form of the sophisticated, technique-driven devices as taught in the later medieval combat treatises, in which fighters used complex tricks to work their way past their opponents' defenses. Neither of these approaches result in combat that matches the shape of the fights described in the sagas (which we believe accurately represent Viking-age fights). We believe that shape was molded by the mindset of the Viking-age fighter: his warrior code. These unwritten beliefs were carried in his heart and guided his behavior in battle, as well as in everyday life. The sagas give us many examples of admired behavior and despised behavior that help to reveal that mindset. The eddic poetry, notably Hávamál, make that mindset even more clear. Many kinds of fighters appear in the sagas: heroes and cowards, bullies and berserkers. Many of them are capable fighters. They seem to be familiar with weapons and ready to use them effectively. These different kinds of fighters use their weapons in similar ways. They are direct, aggressive, efficient, and clever. They seize the initiative to take control of the fight. They do what is necessary to get the job done, when it is necessary to do it, using whatever tools are available. And so, they use clever and improvisational moves. They draw upon hidden weapons or reserve weapons as needed. They improvise weapons out of countless everyday objects that are at hand, using them in preference to conventional weapons at times when the improvised weapon has an advantage. They throw their weapons away, if that has an advantage. They use their weapons in unexpected ways. There are not a lot of moves or techniques described in the sagas. 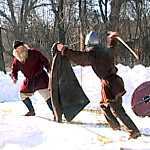 Perhaps Viking-age fighters used only a small number of moves. But clearly, they used them well, completing the job efficiently. They improvised as needed, doing the unexpected when it gave them an advantage. They used a cloak, or a stick, or a stone, or a boat oar as a weapon. They pulled down their opponent's trousers to gain the split-second advantage needed for a killing blow (Fóstbræðra saga, ch. 23). Power and speed were important to a successful Viking-age fighter, but so was mental prowess. It's worth remembering that poetry and combat were thought to be related. Both were gifts from Óðinn, the greatest of the gods. Both required extraordinary improvisational skills, and the sagas suggest that some of the best fighters were also the best poets, including Egill Skalla-Grímsson, Kormákr Ögmundarson, Gunnlaugr ormstunga (serpent-tongue), and Hallfreðr vandræðaskáld (troublesome poet). Additionally, while it was important to dominate physically to win the fight, it was also important to win honor as well, through physical symbols of shame, insulting taunts and curses, and through shaming strokes (klámhögg) such as a stroke across the buttocks (Bjarnar saga Hítdælakappa, ch. 32). The belief that the moment of death was predestined meant that Viking-age fighters were likely to continue fighting in the face of overwhelming odds, and despite injuries and wounds. After Özurr ran Helgi through with his spear, Helgi continued to walk up the spear shaft in order to reach Özurr with his sword (Droplaugarsona saga, ch. 10). 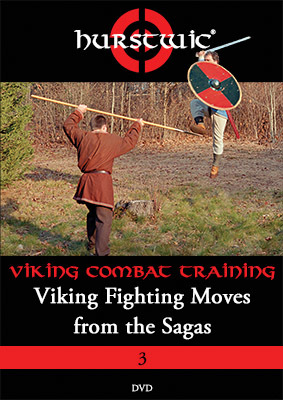 Rather than attempting a text description of the shape of Viking combat, we have created several short videos that illustrate combat moves described in the sagas. 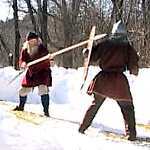 We believe these videos give a better sense of the shape of Viking combat than any text description. ...en Kolbeinn snaraðist við honum og stakk fram öxarhyrnunni og kom í barkann Þórði og hafði hann þegar bana. Kolbeinn sidestepped Þórður and jabbed the horn of his axe into Þórður's throat and that was his death. Askmaður skopar um hið ytra og vildi krækja af honum skjöldinn. Askmaður ran around him and wanted to hook his shield off him. Atli sér að eigi mun svo búið hlýða, kastar síðan sverðinu og hleypur undir Þorgrím og rekur hann niður við völlinn. Atli saw he was making no progress. He threw away his sword and slipped under Þorgrímur's guard and threw him to the ground. Fann hann eigi fyrr en Grettir tók hann upp yfir höfuð sér og færði niður svo hart að saxið hraut úr hendi honum og fékk Grettir tekið það og hafði ekki orða við hann og hjó þegar höfuð af honum og lauk svo hans ævi. Grettir lifted him up above his head and threw him down so hard that he lost his grip on the sax. Grettir took the sax and without a word, cut off his head and ended his life. Egill var þar fyrir í runninum en engi björn og er hann sá hvar Berg-Önundur var þá brá hann sverðinu en þar var hönk á meðalkaflanum og dró hann hana á hönd sér og lét þar hanga. Hann tók í hönd sér kesjuna og rann þá fram í mót Berg-Önundi. But it was Egill and not a bear that was hiding in the bushes, and when he saw Berg-Önundur, he drew his sword. There was a loop on the hilt which he drew over his hand to let the sword hang there. He took his spear in his hand and rushed towards Berg-Önundur. Hann hafði spjót í annarri hendi en í annarri sverð en engan skjöld. He had a spear in one hand and a sword in the other, but no shield. En er þetta var tíðinda þá lagði Freysteinn bófi til Steinþórs og stefndi á hann miðjan. En er hann sá það þá hljóp hann í loft upp og kom lagið milli fóta honum… Eftir þetta hjó hann til Freysteins með sverðinu og kom á hálsinn og brast við hátt. Freysteinn bófi lunged at Steinþórr aiming for his middle. But when he saw this, Steinþórr leapt into the air and the spear passed between his legs… After that, he struck at Freysteinn with his sword, and the blow landed on his neck and made a loud noise. Þorleifur picked it up and lifted it quickly up above his head, intending to bring it down on Arnkell's head. But when Arnkel heard the whistling sound of the weapon through the air, he ducked under the blow. Greip hann þá ásstubba einn og barðist með. He grabbed the stump of a log and fought with it. Grímur hafði tvö sverð því að Gaus kunni að deyfa eggjar. Grímur vó jafnt báðum höndum. Hann brá upp sverði með vinstri hendi en hjó með hinni hægri til Gauss og af fótinn fyrir ofan kné. Grímur had two swords, because Gaus knew how to blunt sword-edges. Grímur fought equally well with both hands. He raised one sword with his left hand and struck with the right at Gaus, taking off one of his legs above the knee. Finnbogi… spratt upp í móti og brá feldinum að sverðinu og snaraði að honum þegar. …he sprang up to meet him, throwing his cloak on the sword and instantly twisting towards him. Og er skjöldur Atla var mjög ónýttur þá kastaði hann honum, tók þá sverðið tveim höndum og hjó sem tíðast. When Atli's shield was split right through, he tossed it away, took his sword in both hands and hacked away with all his might. Þá þreif Björn sporð skjaldarins hinni hendinni og rak í höfuð Þórði svo að hann fékk þegar bana. Then Björn grasped the bottom of the shield with his other hand and drove it into Þórður's head so that he was killed at once. Búi varðist drengilega. Lét hann ganga grjót í fyrstu. Var það jafnsnemma að fallnir voru fjórir menn af þeim bræðrum enda hafði Búi þá lokið grjótinu. Búi defended himself manfully. At first he let fly with stones. By the time he had used up his stones, four of the attackers were dead. Gretti leiddist nú þófið og sveipaði til saxinu og hjó annan fylgdarmann Gísla banahögg og hljóp nú frá steininum og sótti svo fast að Gísli hrökk fyrir allt út með fjallinu. Grettir grew bored of the irksome fight then. He swung his sax (short-sword) and dealt one of Gísli's companions his death blow, then leapt out from behind the stone and attacked so furiously that Gísli was driven back along the side of the mountain. Hann hljóp að með reidda öxina og hjó í höfuð Brandi og klauf hann í herðar niður. He ran at Brandur with a raised axe and struck him in the head and split it down to his shoulders. Kári Sölmundarson kom að þar er fyrir var Bjarni Brodd-Helgason. Kári þreif upp spjót og lagði til hans og kom í skjöldinn. Bjarni skaut hjá sér skildinum ella hefði spjótið staðið í gegnum hann. Hann hjó þá til Kára og stefndi á fótinn. Kári kippir fætinum og snerist undan á hæli og missti Bjarni hans. 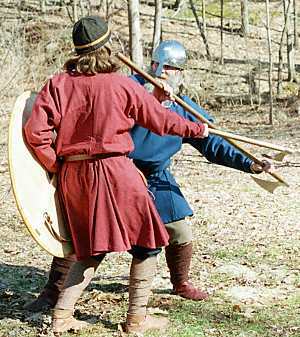 Kári Sölmundarson came up to Bjarni Brodd-Helgason; he grabbed a spear and thrust it at him, and it hit his shield. Bjarni jerked his shield to the side - otherwise the spear would have gone through him. He swung his sword at Kári's leg, but Kári pulled back his leg and turned on his heel, so that Bjarni missed him. …slær hann fæti sínum neðan undir skjaldarsporðinn svo hart að skjöldurinn gekk upp í munninn svo að rifnaði kjafturinn en kjálkarnir hlupu ofan á bringuna. …he kicked the bottom of the shield up into his mouth so hard that his face ripped open and his jaws fell down to his chest. Og er hann kom í skaflinn skaut Helgi Droplaugarson til hans milli fótanna og í gegnum kyllinn og féll hann á bak aftur en spjótið festi í skaflinum og hékk hann þar á skaflinum allan daginn. But when he came into the snowdrift, Helgi Droplaugarson hurled a spear between his legs and pierced through the scrotum, and he fell backwards, and the spear stuck fast in the snowdrift, and he hung there on the snowdrift for the whole day. Og er minnstar vonir voru bregður Þormóður höggöxi undan skikkju sinni og höggur í höfuð Loðini svo að hann féll þegar dauður til jarðar. And when it was least expected, Þormóður drew out an axe from under his cloak and struck at Loðinn's head so that he fell to the ground dead. Í því leggur Refur spjótinu á Þorbjörn miðjan. Féll Þorbjörn á bak aftur og gat ekki brugðið sverðinu. Var það og friðbent enda bar bráðum að. At that instant, Refur thrust his spear through Þorbjörn's middle. Þorbjörn fell backwards. He had not been able to draw his sword because the peace straps were fastened. Jökull … spratt upp og hljóp að honum, laust milli herðanna Bergi með hjöltunum svo að hann féll við áfram. Jökull sprang up and leapt at Bergur, and struck him between the shoulder-blades with his pommel so that he fell flat on his face. Síðan tók hann í hár honum og kippti honum fram á stokkinn og hjó af honum höfuðið. He grabbed him by the hair, dragged him to the bedstead and chopped his head off. Finnbogi … snarar síðan höfuð hans og brýtur á bak aftur og linast hann heldur við slíkar byxingar. Finnbogi … snapped his head back, breaking his neck. With such rough treatment, Þorbjörn quieted down considerably. Þá þreif Atli spjótið og skaut eftir honum. Brynjólfur kastaði sér niður við vellinum en spjótið flaug yfir hann fram. Atli grabbed his spear and threw it at him. Brynjólfur threw himself to the ground, and the spear passed over him. Halldór komst á bak Vala og beitir á hásinar honum Hvítingi. Halldór got at Vali from behind and used [the sword] Hvíting on his leg tendons. Hann settist niður og drap úr geirnaglann því að hann vildi eigi að Þorbjörn mætti aftur senda. He sat down and removed the rivet from the shaft, to prevent Þórbjörn from throwing the spear back at him. Þangað bárust þeir að svo að fætur Gunnars námu helluna. Þá sleppti Gunnar þeim tökum sem hann hafði áður haldið en tók báðum höndum í axlir honum en hljóp sjálfur öfugur upp yfir helluna og í því kippti Gunnar að sér blámanninum svo snöggt að hann tók sundur í tvo hluti við hellunni. They struggled across the field until Gunnar's feet touched the slab of stone, when he released his hold, took the black man by both shoulders and leaped over the stone backwards. As he did so, Gunnar jerked the black man towards himself so suddenly that he split in half across the stone. 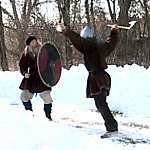 Many more examples of fighting moves from the sagas are used to illustrate the remaining Viking arms and armor articles on the Hurstwic site. In addition, we have created a DVD that demonstrates and teaches 19 fighting moves and tactics taken from the pages of the sagas. The sagas show an aggressive, direct fighting approach using simple moves, along with clever moves and spur-of-the-moment improvisation as needed to overcome an opponent's defense. It is this shape that we believe defines Viking-age combat.